Most shooters that have been around for any time at all know of the big names in ammunition. Federal, Remington, Winchester, CCI and Hornady easily come to mind when talking training, hunting, match, and defensive ammo. There are several others of course, including foreign companies that manufacture ammo. But there are a few other ammo brands right here in the US producing high quality ammo for a variety of purposes you may have never heard of. Sig Sauer is probably best known for its exceptional line of handguns and rifles. You may have even heard of the Sig Sauer Training Academy that has been around since the late 1980’s. However, many folks probably do not know that Sig has been in the ammunition business since 2013. Since its start in Kentucky the ammo part of Sig has now moved to Jacksonville Arkansas. The ammo division is now offering a full line of Practice, Defensive Match and Hunting ammunition along with brass for the reloading enthusiasts. I have personally tested their match ammo in .308 Win and can say that it is both accurate and reliable. Manufactured in the following calibers; 22-250 Rem, .223 Rem, .243 Rem, .300 Blackout, 6.5 Creedmoor and .308 Win, Sig Hunting line of ammo offers a good selection. 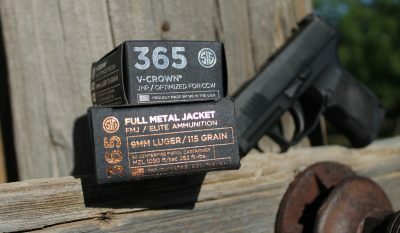 Sig states that their “HT superior hunting rounds yield consistent 1.8X diameter expansion using an all-copper projectile with optimized nosed geometry and premium nickel-plated shell casings, delivering consistently reliable accuracy for taking down game.” My intent is to try Sig hunting ammo in the field on a hunting excursion soon. The company currently offers 82 “mainstream” calibers and another .17 special order calibers. They can take any special order under certain quantity requirements. DT Defense; includes both handgun and rifle offerings based on self-defense needs. DT Hunter; again both handgun and rifle cartridges built for the hunting environment. DT Long range; rifles ammunition specifically produced with the long range shooter in mind. DT Safari; heavy rifle cartridges built for your African Safari. DT Target; you guessed it, primarily built for handguns and target shooting, although .223 and .308 is also offered in this category. Based out of Ruleville, Mississippi, this company has been around since 1982, long enough that I’m embarrassed to say I should have known of them. The company is perhaps better known for ammunition components such as bullets. However the company offers two distinct lines of ammo geared towards training and competition. Their “Performance Standard” line is remanufactured, using only once-fired cases. This ammo has undergone an extensive case processing operation to bring it back to factory SAAMI (Sporting Arms and Ammunition Manufacturers’ Institute) specifications. Precision Delta uses a match grade bullet designed for this line of ammo. The “Performance Standard” line is produced in 9mm, .40 S&W, .45 Auto, .38 Special, and .223 Remington. While pricing for this line is not at bargain basement levels, it is reasonable and sold in bulk quantities. Precision Deltas’ next line of ammo is the “Performance Pro”. This category uses the company’s own precision-made jacketed bullet and is engineered for optimum performance. They use new, high-quality brass for this load, specialized for precision and competitive shooting. The Performance Pro line is manufactured in 9mm, .40 S&W, .45 Auto and .38 Special. Most shooters have a long standing, tried and true favorite ammunition. But these companies could provide you with some unique and different choices for your shooting needs on several levels. The post Ammo Brands You Probably Have Not Tried.. But Should appeared first on OutdoorHub.